Well, this exchange has been interesting. My partner is from the Netherlands, so I'm making her a couple things and trying to send her a bunch of unusual stuff from the US. Mom and Dad want to go to Michigan later this week, so I'm taking Thursday and Friday off of work. Hopefully I'll get to stop by the Library of Michigan! I got to see the puppies this weekend. My goodness, they're little ladies now! Nearly nothing remains of their cute baby faces, and in their place is soft, muscular adult ones. I'll have to update my pictures! I'm trying to learn how to do that "picture from a photo" trick that everyone seems to do in photoshop. I think it'd make an awesome blog header! Socks. What's up with that? I made a post over at craftster because lately it seems like socks are EVERYWHERE. And yet, I just couldn't give a damn about them. I like the stitchwork, the lace, but it just doesn't seem worth the effort to me. Legwarmers? Sure, people actually see those. Slippers? Great, and comfy! And knitable on needles and looms. But socks? I just can't see the time and effort involved in doing something on size 1,2,3 needles with a lot of complication to them. I do realize that they do work up fast for a lot of people. But it seems like I could just do a cute cloth, handkerchief, headband, amiguriumi, or something better with my time! 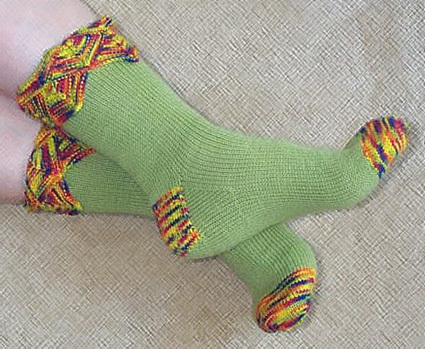 "If you are at all an impatient knitter, socks are the greatest project. Socks are kind of like the knitter's Choose-Your-Own-Adventure pattern." "Socks are kind of like the knitter's Choose-Your-Own-Adventure pattern." That's what I love about knitting - some simple items that you wear can be changed in an infinite number of ways. But why apply that theory only to socks? Why can't other items be just as quick and fun? Socks. I just don't get it. Swapping - what's the big idea? - Craft pr0n image heavy! I've been asked this question a bunch by my friends and family since I'm involved in the KKEXNMORE Yahoo group, which swaps loomed/handcrafted items, AND I've been involved in several Craftster.org swaps. Personally, I'm thrilled to get mail. Any mail. It doesn't matter if I'm getting postcards for selling my non-existent ugly house, I just like to get stuff. 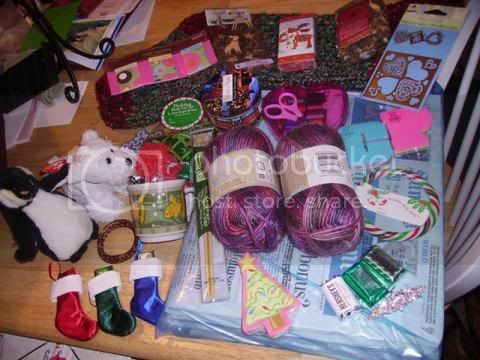 But the best mail is by other crafters - you know how much work they put into it! I've gotten a few bad ones here and there. But overall, I've been thrilled with what I've received. I have a disease, round 2, where you named a disease and your partner crafts items for you based on it. 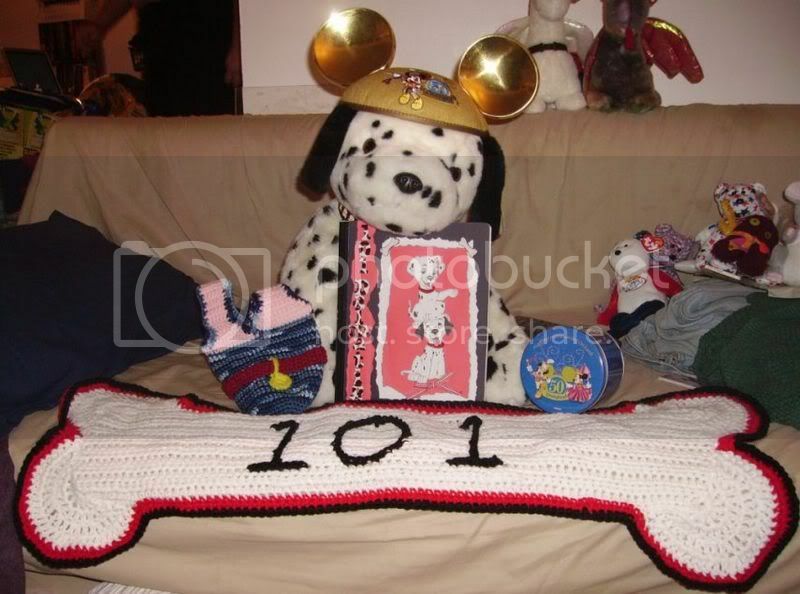 Little Visitor, where a small creature comes to visit you and you send one in return"
Disney Round 5(minus my dalmatian LOL), where you named your favorite movies and crafted items based on them. Afghan Squares All of the afghan squares I made for the friendship afghan exchange at KKEXNMORE can be seen here. If you see this, take some time to go to Plaid Online and contact them regarding the Harry Potter stamps. I totally want to get some! 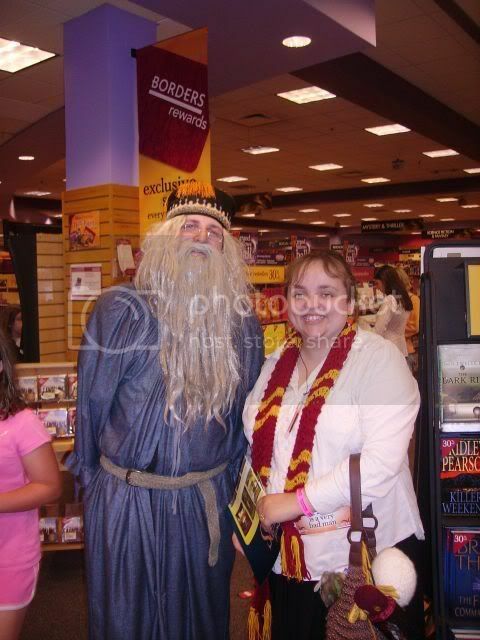 Anyway, here's a pic of me at the HP book release party. 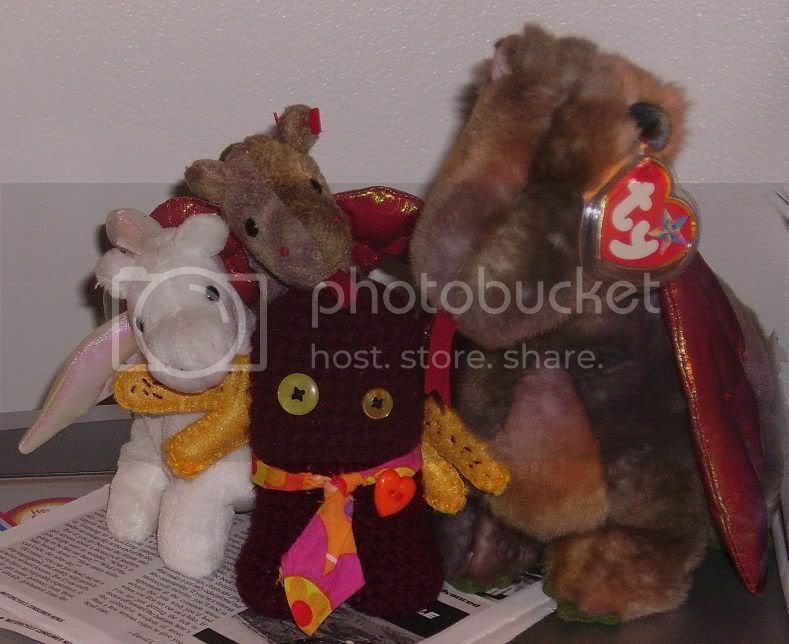 I brought my "Little Visitor", Scorch the dragon and the Owl from an HP swap. The scarf I wore was what caused the most commotion. 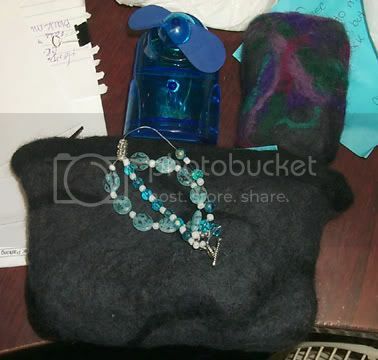 I had TONS of teenage knitters come up to me and ask me how I made it, except I didn't make it - it was a Craftster swap! The "Luna" radishes also came from the HP swap. I was paired with a VERY good crafter! So I was looking at these online after purchasing one for my mother a couple years ago. I'm thinking it might be worth it for DH and I to get one. We still haven't quite got the knack of cooking for two, and I hate for things to go into the landfill purely because we can't cook little enough. So I keep pondering. I've heard from my freezer OAMC group that the canisters are lifesavers and save quite a bit of money (and hence, make the purchase price easier to swallow). We don't have a large freezer, but I'm thinking a bunch of little canisters would be pretty nice and organized in the fridge. And then we wouldn't lose our Costco purchases of staples like frozen edamame, mixed vegetables, meats, etc. Here's the canisters - they're like, $22. Not bad, I bet I could find them on eBay or Amazon for less. DH comes home tonight so I think I'll ask him about it. I'm really digging this idea of doing a lot of cooking in advance, and then using the fruits of your labor as you go throughout the week. They should give him some food, humanely catch him and set him free somewhere good for him. Poor little guy. He's not hurting anyone, and they're harassing him like this. Coyotes typically don't bother people, but officials use that as the reason to bother them. If we stopped putting up 7-11s and Old Navys everywhere, maybe the coyotes would stop losing their territory and "bothering" us. Okay, so I've had it with Yahoo 360. Its hard to use, people have a terrible time finding it, and I want something I have more control over. And most people don't know me by roostercf (of which I would tell you why I chose it, but that would be a LOT of personal info). All of the existing posts will stay there, so if you'd like to see my older projects, please check it out. I'm still going to use my 360 as a good way of keeping track of my friends and for Yahoo groups, but I'm going to try to start blogging here.